Local nightlife impresario Ravi DeRossi’s latest venture is a Victorian and Steampunk-themed bar, and it’s set to open at 6 p.m. tonight. 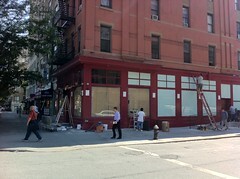 Restaurant-construction voyeurs may have noticed a couple of new developments: the plywood that has long obscured Nicoletta, Michael White’s forthcoming pizzeria on the corner of Second Avenue and East 10th Street, came down yesterday. Today, a banquette was awaiting installation; a representative for the restaurant said it’s aiming to open in the next two weeks, pending Department of Buildings inspections and liquor license approval. 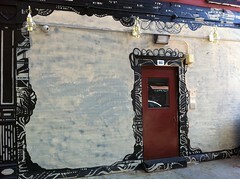 “The chef wants to get in and make sure he gets to do some work as well,” said the rep.
And over at Gin Palace, the forthcoming cocktail lounge from Ravi DeRossi of Death & Co., Mayahuel, the Bourgeois Pig, and Cienfuegos, antique-style lighting has just been installed over the mural that David Nordine is working on. A worker on the scene told The Local that the Victorian gin joint is aiming to open June 11.